Passive RFID tags typically emit radio waves in the range of 300 MHz to 300 GHz, which is in the microwave to UHF range of the electromagnetic (light) spectrum. 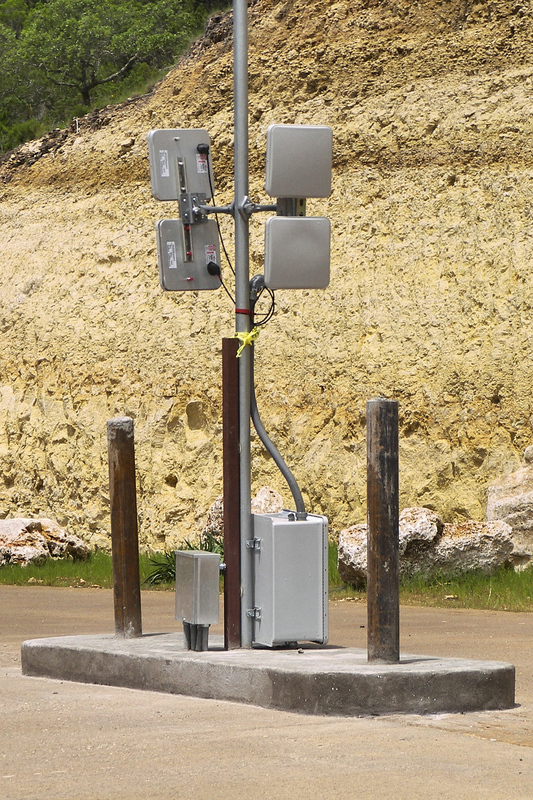 Most international standards today use radio waves of less than 1 GHz. Within this part of the spectrum, the signals can penetrate through most objects and people, and thus the tag and the reader need not be in line of sight to work properly. RFID tags that are used to label and identify manufactured goods can typically be read passively through the magnetic induction process if the reader is within a few meters of the RFID antenna, although some powerful readers can detect passive RFID tags up to 15 meters away. Thus, a portable hand-held reader can be used to determine what is in a shipping container merely by activating the reader nearby the container. The reader will receive back from the RFID chip the unique identifying numbers stored within tag, which then can be associated with the manufacturer and product name using a computer database networked to the reader. In fact, many different products labeled with different RFID tags can be read nearly simultaneously with a single reader and without opening a container, which makes RFID the most efficient method of identifying physical items like raw materials and products. Thus, RFID chips and the unique identification numbers they contain have primary use as tags for manufactured goods, although as we will see their use can extend to virtually anything in the world. For example, RFID tags can be embedded within items as they are being produced or they can become a part of the labeling or packaging of a finished product. Either way, the RFID circuitry is thin enough that the chips can be sandwiched between layers of paper, plastic, or even hidden under the visible product brand labels seen on every commercial product. If the tag is associated with an ID card or access card, the RFID chip and antenna are sandwiched within the multi-layered design of the plastic card during manufacture. The chip used in RFID tags can allow read-only or read-write capability depending on what the tag was initially designed to do. 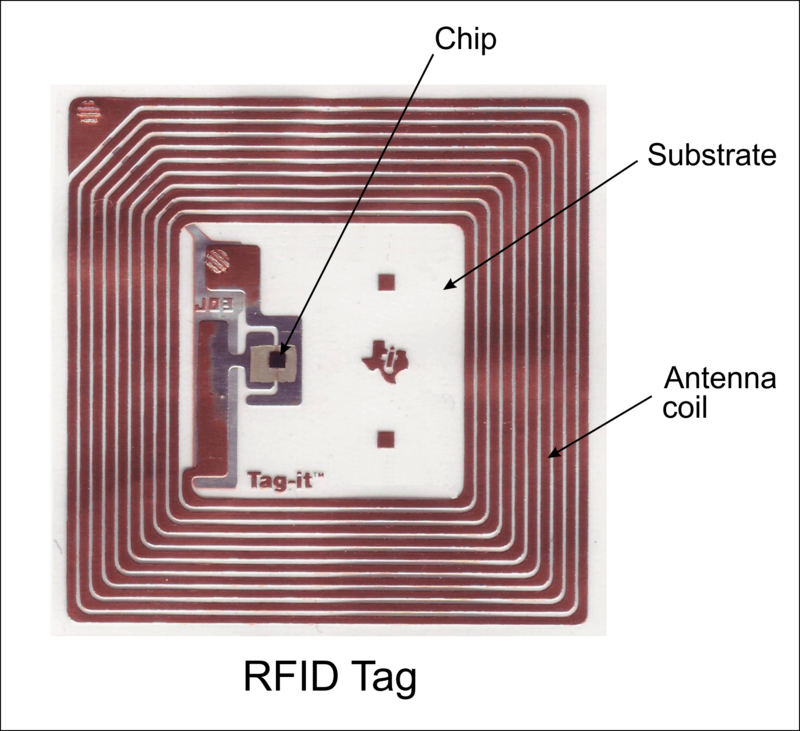 The memory within the chip can be programmed at the time of manufacture or it can be programmed at the point the RFID tag is placed into service. If it is reprogrammable, the memory typically can be rewritten by users or specific applications over 100,000 times during its useable life. The electronic operation of RFID tags and the system used for encoding them have become universally standardized by a consortium of over 120 independent entities working together through MIT’s Auto-ID Center. The standardization process has included input from governments, academic institutions, and corporations to create a global system for electronic marking using common protocols. These RFID tagging protocols have become known as the Electronic Product Code (EPC). This is the chip-based cousin to the barcode marking system used on all retail items at the point of sale, such as the Universal Product Code (UPC) in the U.S., the European Article Number (EAN), and the Japanese Article Number (JAN) [see the section on Barcodes and 666]. In fact, when the EPC is used to identify a trade item such as a product, the EPC code also contains within it the actual barcode numbers associated with the particular manufacturer and product that appears visually on the label at retail. The EPC standard was created to form a global system of product identification that uses common electronic methods and product codes regardless of where a product is manufactured or a tag is scanned. In other words, the EPC number can be used to specifically identify any item labeled with it. This includes more than just consumer products. 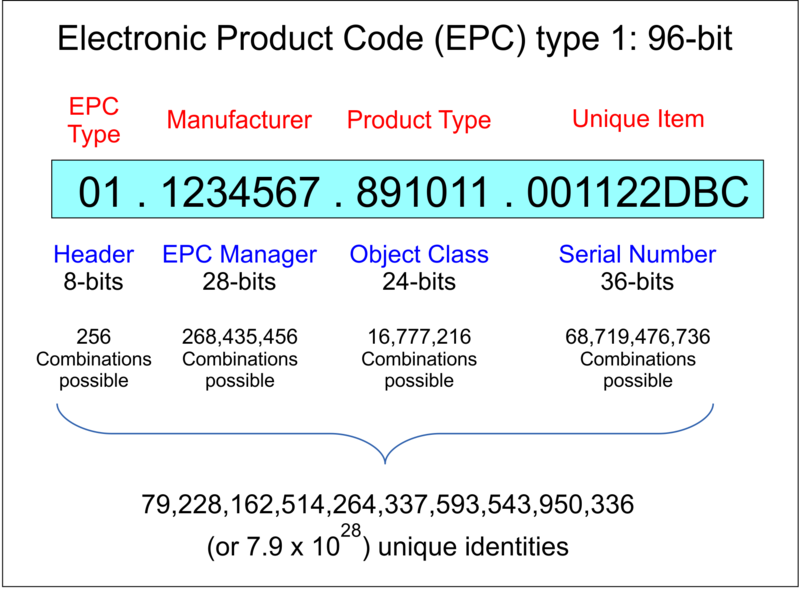 The basic format of the most common EPC (Type 1) consists of four parts containing a string of numbers or letters, which include a header, the EPC manager number, the object class, and the serial number (see illustration). The four parts of the 96-bit EPC allow for the header to consist of a 2-bit code followed by the EPC Manager region as a 28-bit code, followed by a 24-bit object class code, and a final 36-bit serial number code.  The header identifies the EPC’s version number and allows for various lengths or types of codes for different applications (i.e., some EPC formats have encodings with different bit lengths). The EPC manager identifies the manufacturer of the product and correlates exactly to the first half of a barcode for retail items. The object class identifies the type of product made by the manufacturer and the serial number identifies an individual item. Each region of the code is separated by periods in the visual representation of an EPC to easily differentiate the discrete parts. Adding all the parts of the code together we find that the complete EPC Type 1 is therefore a 96-bit binary number that allows for 296 or a total of 79,228,162,514,264,337,593,543,950,336 (7.9 x 1028 or 79 octillion) unique RFID identities! This is an amazing number of combinations. In fact, it far exceeds the number of encodings possible with barcodes or other product identifiers. As we will see, the plans for RFID are to tag virtually everything humans make, interact with, or own, so the length of the code is an important consideration for accomplishing this goal. Of course, the EPC also has the capability to provide an electronic ID to every individual in the world with plenty of additional numbers available to label every other physical item imaginable. The GS1 group coordinates the standards and operation of all EPC-related tagging. The object class and the serial number of an item are assigned by the EPC owner (such as the product’s manufacturer), but they must conform to the standards set by the GS1 group. The object class is a powerful identifier that separates an EPC into a number of potential application areas. The current EPC standard allows for different classes of objects to be labeled, for instance, an item may be labeled as: 1) a trade item (such as a product or raw material), 2) a logistical unit, 3) a location identifier, 4) a returnable or reusable asset, 5) a fixed asset, 6) a document, 7) a service relation (i.e., a loyalty card or a library card), 8) a U.S. Department of Defense supply chain item, 9) aerospace and defense parts and items, 10) technical industries components and parts, and 11) an unspecified general category. The particular class of an item is encoded within the object class field of the EPC and more classes are possible than those listed here. “…used to assign a unique identity to an instance of a trade item, such as a specific instance of a product” (from: GS1 EPC Tag Data Standard 1.7, Ratified May 23, 2013; see http://www.epc-rfid.info/sgtin). The GTIN identifier contained within an EPC for products directly correlates to the numbers associated with manufacturers and products used on retail barcodes. Therefore, a unique EPC code from the trade item class would be associated with each type of product manufactured in the world. However, the total length of the EPC including its serial number allows for much more powerful uses than a typical barcode label, which since the 1970s is printed on every retail product that moves through the point of sale (POS). The standard barcode provides a visible code that includes numbers readable by humans and also the same numbers encoded with bars which are readable electronically (the barcode itself) to identify each individual product type. With bar codes each bottle of a brand of dish detergent from the same manufacturer has the same bar code on its label regardless of where it is sold (if it is the same sized bottle). However, the EPC not only can be used to identify a product type, such as a bottle of dish detergent sold by a particular manufacturer, but it can be used to identify every individual bottle of dish detergent with a uniquely different code—a code which is distinguishable from all other bottles of the same type of detergent. This is because an EPC for a product contains a serial number in addition to the standard barcode information. The EPC code and serial number combined are actually long enough to identify not just different products, but virtually every item in the world with its own unique number! This is incredible. What this means is that every bottle of dish detergent manufactured by a particular company can have its own unique code—not just a product specific code; not just a lot specific code; but an ID number specific and unique to each bottle that is packaged. Even if billions of bottles are packaged by different manufacturers, the EPC can provide a unique number for each one! In this way, if you buy a product containing an RFID tag, it will contain its own EPC number that is distinguishable from all other EPC product numbers. Depending on the application of an EPC, the code may also contain information such as the weight of the package contents and the number of units contained within a package. In addition, it might contain the batch or lot number of the material and for certain products such as pharmaceuticals, it might have information related to the expiration date and potency of the product. For more information about the EPC standards, see the GS1 General Specifications available on the GS1 EPCglobal web site (download pdf). Given that an EPC is permanently associated with a particular RFID chip, every product labeled with one can be individually tracked by scanning the tag. This also means that when a person uses a credit card or a smart card to buy a product with an EPC RFID tag, they will have their card directly linked with the EPC number on the item(s) purchased. The store and the manufacturer of the product will know who bought it, because only that single product item and package had that unique EPC number. Since the RFID tag is scannable by any RF reader at any time—not just at the cash register when the item is purchased—the product can be tracked as you take it from the store and bring it home. If it is an item of clothing or something else you keep with you at most times, then the tag(s) could be scanned every time you pass a scanner. If a retail store or business had RF readers at its entry doors, for instance, then as you pass through the door the store would know what products you had on your person. And since your card was associated with those products when you initially purchased them, the global RFID database can tell the store or business your identity as you enter. This system is eerily similar to the movie Minority Report when Tom Cruise had his iris scanned every time he walked through public areas. Instead of scanning irises, however, someone with an RFID tagged item or an RFID card can have his or her EPC number(s) scanned and then be presented with personalized communications throughout a store. In 2004, Sprint developed an RFID loyalty card system that has exactly these capabilities. Anyone that has an RFID card with them as they walk within 10 feet of a scanner will have his or her card scanned and the store will know who you are. Sprint linked this identification technology with a computer avatar system that would communicate with customers at various kiosks throughout a store. Even hotels have started exploring this type of technology to provide services to their guests (Information Week). The surveillance capabilities of RFID tags are potentially more extensive and intrusive than other forms of people tracking. As businesses and governments set up RF readers within stores, buildings, government agencies, and along roads and walkways, people can be located and tracked just by repeated scans of the items they wear and carry with them. Without even realizing it is happening, an extensive database of the identities and movements of people and things can be created. This database could be used for personalized marketing—for instance, sending targeted advertisements to your smart phone or to your e-mail address concerning products related to the ones you have already purchased—or it could be used by governments to monitor and control entire populations. Any out of the ordinary purchases or unusual movements of people or items could be flagged as being suspicious through the use of computer algorithms designed to detect such events. You could become a subject of an investigation simply because you were identified as associated with an item or you had suspicious contacts with other people—all identified through RFID tracking. It is clear that any right or expectation of privacy in an RFID-enabled world would quickly disappear as scanners appear everywhere and citizens are compelled to carry their RFID-containing documents and products. The size of RFID tags is also shrinking fast and the formats in which they can be constructed are highly flexible, allowing for diverse placement within products and the environment. 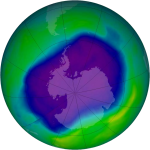 They are easily hidden within the layers or seams of clothing, sandwiched between sheets of paper or cardboard, attached to the back of product labels, molded into synthetic products such as plastic parts, the soles of shoes, or even rubber tires, or injected into animals or plants. The latest technology was developed out of Kris Pister’s lab at Berkeley and uses tiny RFID microchips in the mm2 size, called smart dust, which can contain a power supply, a fully programmable microprocessor, and its own operating system called TinyOS. Networks of scattered smart dust can be created to communicate over broad areas through short range radio signaling between chips, making seamless RFID signaling systems to monitor and track other RFID tagged items (or even people). In 2010, it was reported that Hewlett-Packard plans to distribute over a trillion of these smart dust transponders to create what they call “Central Nervous System for the Earth” (see ‘Smart dust’ aims to monitor everything). It is clear that the RFID society is already taking shape on a global basis. RFID technology is being used in retail tracking of products, in warehouses to maintain inventory and track the shipment and delivery of products and raw materials, to monitor the logistics of material movements, as toll payment devices while traveling highways, as personal access cards to enter secure buildings or areas, as protection devices for expensive electronic equipment, as tags for livestock and pets, and they are even present in the chips casinos use for gambling purposes. The movement toward full implementation of RFID is accelerating as we see the technology being merged with smart cards for use in a cashless society. Soon people everywhere will be tracked by the smart card IDs they carry or through the items they purchase and wear. No one will escape the surveillance capability of an RFID-enabled economy and the global security system now being constructed. The power of the RFID/EPC system for encoding physical items is being exploited in an attempt to create what has been called the Internet of Everything. With the development of the Internet and the World Wide Web over the last 20 years, you could say that the global network has been developed at this point into an Internet of Things. The things that are currently connected are supercomputers, servers, PCs, laptops, and more recently smart phones, tablets, gaming consoles, media players, and other devices that link directly to the Internet. Each of these computers and devices is given an Internet address to allow direct communications through the network. For instance, as you read this section your computer is receiving the web page data from a remote server that runs the web site. How does the server know to send this data to your computer and only to your computer? Because as you connected to the Internet, your computer was given a web address according to the standard Internet Protocol (IP) designed into the global network as it was being constructed. An IP address consists of a set of numbers separated by periods, such as 50.63.69.29, which is the address for this web site. Every web site you visit and every device connected to the Internet is assigned a unique IP address to distinguish it from all other addresses. Data is sent between sites using the IP addresses to end up in the right location as it is sent through the Internet’s trunks and routers. The RFID/EPC technology now being deployed will soon be used to add every RFID tagged item to the Internet, not just computers, servers, and smart devices. The plan is to extend the Internet to include virtually everything in the world that can be tagged and give each item its own unique IP address. To accomplish this feat, the IP address standards are being modified to allow for significantly more addresses than are now possible using the current standards. The current standard, called IPv4, is a 32 bit numbering system which is able to accommodate 232 nodes or 4,294,967,296 (4.3 billion or 4.3 x 109) IP addresses. With the rapid expansion of the Internet, IPv4 has been overwhelmed by the demand for additional addresses. In fact, for all intents and purposes the current Internet and IPv4 cannot accommodate any additional addresses. There are already too many devices linked to the Web and the vision for the Internet of Everything is far too expansive to be fulfilled with IPv4. The next Internet Protocol standard, however, called IPv6 (they skipped IPv5), is a 128 bit system that can dramatically expand the number of nodes connected to the Internet. Instead of just 4.3 billion (4.3 x 109) IP addresses with the old IPv4 standard, IPv6 can accommodate 2128 or an incredible 340,282,366,920,938,463,463,374,607,431,768,211,456 (or 3.4 x 1038) nodes. This number is so huge it is beyond comprehension. It likely exceeds the number of estimated stars in the universe. The protocol will allow anything conceivable to have its own Internet address, including computers, smart devices, and even every item manufactured and tagged with an RFID chip from this point forward. In fact, the IPv6 standard would accommodate nearly 50,000 trillion trillion IP addresses per person now alive on Earth! The new IPv6 protocol combined with the RFID/EPC technology allows everything to be labeled and tracked in real time through the Internet. The global vision for the Internet of Everything is to have RFID readers positioned in all locations people travel and RFID chips embedded, labeled, or tagged on everything manufactured or used by humans. The Internet then would assign a unique IP address to each EPC code and track items and smart devices everywhere they go. There are proposals being considered now to determine how to map an EPC directly onto a resultant IPv6 address so that the EPC appears within the Internet address. If the item containing an RFID was a smart device with contactless technology that was linked to the Internet, then it could communicate through more than just an EPC number; it could also run apps and software programs designed for any purpose imaginable—including buying and selling in the Empire of the Beast. When the Antichrist arises, his global Empire will use this system to control all commerce and track the movement of every item bought and sold throughout the world. It will be a system of surveillance and control like no one could possibly have imagined before our time, where people and things are tracked everywhere they go and no one can buy or sell without proper authorization and credentials. These RFID smart cards will allow tracking of the citizens of Shenzhen as the government positions hundreds of thousands of readers around the city. As people walk by these unobtrusive sensors or enter doorways containing RFID readers, the government (and companies) will be able to know every movement of individuals throughout the city. The fear is that these cards, which are also being issued in many other countries throughout the world, will be used to exact complete control over entire populations. Privacy will become a thing of the past. In the name of security and safety, governments are instituting systems that will be able to exert total tyranny over everyone. Even the free countries of the world will not be immune to this surveillance and control technology. In the U.S., drivers’ licenses could soon have both smart card and RFID capability (WorldNetDaily). Some are warning that this ID card system containing a contactless RF chip could be used to tag and track every adult in the country. Contactless smart cards are different than RFID chips in that the antenna that sends and receives signals is typically connected to the microprocessor within the card instead of being connected to an RFID chip. The microprocessor within the smart card is capable of running applications that the chip in an RFID tag is not. However, contactless smart cards can function in a surveillance society much the same as RFID tagged products. RFID readers positioned at key entryways or along streets where many people walk could silently send out signals to any nearby contactless smart cards within range. Any RFID cards enabled by the signal would send back a unique identifying number telling the reader whose card was nearby. The ID numbers would then be transmitted across the network to computer databases assembled to store information on the movement of every individual based upon their incidental passage near such readers. The government could use this technology to monitor anyone entering a facility, such as public arenas, Federal and State buildings, transportation hubs, or even venues such as sporting events, political rallies, and organizational assemblies. An evil government could easily turn this “security” system into a method of tracking political opposition parties or groups identified as politically incorrect by the ruling party, thus squelching opposing views or stomping out resistance movements. Although every person would not be monitored continuously because of the incredible volume of data generated by this system, computer algorithms would be used to identify any unusual activities or movements of people, which are outside normal day-to-day routines. RFID tags and contactless smart cards thus make surveillance of people easier and better than any system yet devised. RFID is silent, cost effective, and efficient; it does its job without anyone even realizing that they are being monitored and tracked. Contactless smart card IDs incorporating RF technology will soon allow the total control of society. The terrorist threat in the wake of 9-11 is the major driving force behind many such security strategies. Although there remains in the U.S. strong support to prevent terrorism, immediately after the Real ID Act was signed by President Bush a significant opposition developed to the concept of a national ID card. The result has been a delay in the implementation of the Act, but it has not been abolished completely. The current target date for each state to introduce enhanced ID cards is December 1, 2017. As of this writing, 19 states have issued ID cards that are in compliance with the law; however, exactly half of the states have indicated that they will not comply and some have passed laws to prevent its implementation. 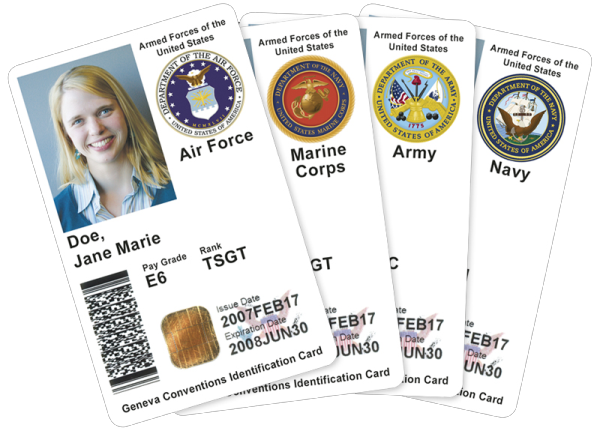 Since all other nations are rapidly implementing national ID cards that have RFID and smart card technology embedded within them, it won’t be long before the U.S. will have to employ the same standards as the rest of the world, especially to facilitate secure travel as well as interaction with point of sale (POS) terminals throughout the world. Once the Real ID Act is fully realized, the cards likely will be a combination of smart card and RFID technology (e.g., contactless smart card), and it may turn out to actually be the final card and ID system before the Mark of the Beast arises. The DHS calls the RFID-enabled drivers’ licenses or EDL cards “critical to securing America against terrorism”. 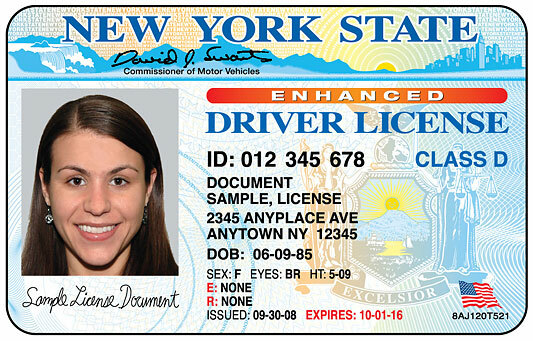 The government agency also says that EDLs are a “vital component of a holistic national security strategy” (http://www.dhs.gov/secure-drivers-licenses). The arguments today for enhanced procedures to ensure identity are always correlated to the threat of terrorism or fraud, which they know will more effectively get people to go along with the new measures. “Obtaining fraudulent identification documents presents an opportunity for terrorists to board airplanes, rent cars, open bank accounts, or conduct other activities without being detected”, says the DHS. Unfortunately, the result of these new government policies is the creation of a greater surveillance state that can track all citizens, not just terrorists or criminals. The EDL cards are being touted as a more palatable solution to the national ID cards mandated by the Real ID Act; however, the new card requirements are actually much worse with regard to personal privacy than the previous requirements. EDL cards will bring about the RFID- and smart card-enabled national ID system that people like Katherine Albrecht and Liz McIntyre (http://www.spychips.com/) have been warning about for years (see: Albrecht, K. and McIntyre, L., 2005, Spy Chips: How Major Corporations and Government Plan to Track Your Every Move with RFID, Nelson Current, Nashville, TN). If everyone is required to carry an EDL card, then the movement of every citizen can be tracked as they present their card for identification purposes or as they unknowingly pass an RFID reader. The EDL cards will be the first time in U.S. history that the process of proving your identity will require a chip. With RFID, there has never been a greater possibility for total surveillance and absolute tyranny. 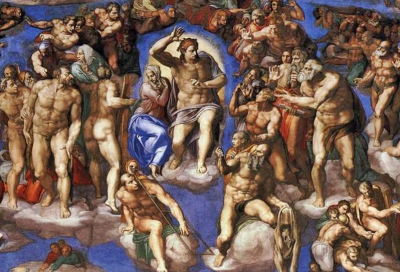 As the world moves toward the final global empire that is predicted in the Bible the implementation of RFID and smart cards will allow the Antichrist to gain complete control. In another example of RFID tracking of humans, a vocational school in West Cheshire in the U.K. has reportedly been using RFID-enabled badges for years; however, it has recently come out that the RF technology within the badges consists of an active tag, which is battery powered and large enough to permit tracking almost continuously anywhere on campus. The ID tags were supposedly to provide security through identity validation of students and faculty, but it turns out they also included the potential for extremely intrusive surveillance of every person on a real time basis. The ultra-wideband RFID tags in the student IDs were read by RF sensors positioned throughout the school and campus property. Students and staff wore the badges as part of a three-year trial to see if the tracking system would work as envisioned. The trial became known only recently when people opposed to such monitoring revealed it by obtaining previously secret U.K. government documents. These active RFID tags are similar in design to the active tags used for paying road tolls on highways without stopping at toll booths. They have become popular in the U.S. and many other countries for improving traffic flow. However, they also allow tracking of vehicles as they move along the highway system. The RFID readers used in toll collection also are being deployed on other roads for surveillance purposes and not to collect tolls. As people drive through cities, hidden RFID readers can be tracking vehicles through silent signals sent to their toll collection transponders. As these devices proliferate, it will become possible to locate an individual vehicle anywhere it goes simply by networking the data flowing from the surreptitious readers positioned throughout the road systems. Clearly, the monitoring and surveillance capability of advanced RFID tags present an incredibly powerful system for government and business to track people and things in real time. The danger that this poses from a Big-Brother, totalitarian perspective cannot be underestimated. If real-time RFID chips are incorporated into biometric smart cards then the Empire of the Beast will have unprecedented powers of control never before possible by any other regime in history. All of these developments are a prelude to the final Mark.